Improve the ergonomics and comfort of your Q2 with this dedicated Thumb Support from Leica. 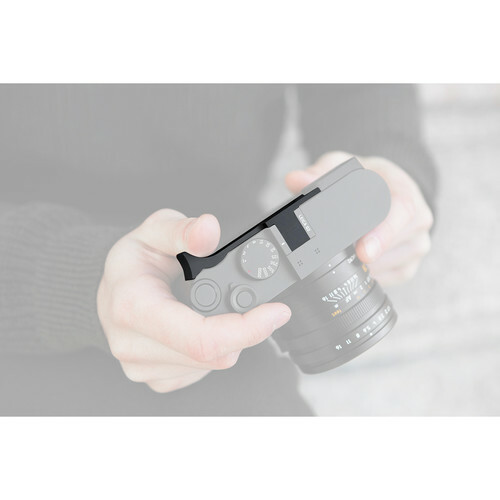 By sliding this device into the hot shoe, users will be able to more comfortably rest their thumb against the camera body and enjoy a steadier and more secure grip, especially during one-handed operation. Does the thumb support cover up one of the buttons on back of camera? It does cover the eyepiece correction button. If you need to make adjustments to the eyepiece correction, say if another user was using the camera, you would simply slide the thumb support off, make your corrections and slide it back on. Access to the crop mode button is integrated into the thumb support. Will this work with the original Q?